Recognized for centuries, laminitis is an all-to-frequent, and sometimes devastating, condition affecting the connections between the horse’s hoof wall and the vital structures inside the hoof. Although diagnosis usually isn’t difficult, laminitis remains a frustrating condition to treat. Laminitis is a failure of the attachments of the epidermal layers (laminae) of the hoof wall to the dermal laminae attachments of the third phalanx. The laminae suspend the distal phalanx inside the capsule formed by the hoof wall. Although inflammation develops as the condition progresses, inflammation does not appear to be the primary insult. The commonly used term, “founder,” refers to “sinking” of the third phalanx within the hoof capsule. Downward force from the horse on the failing laminar attachments, combined with pull from the deep digital flexor tendon’s connection to the third phalanx, can result in displacement of the bone inside the hoof capsule. Some cases may resolve spontaneously. In more severe cases, pull of the deep flexor tendon may result in “rotation” of the third phalanx, where the toe of the bone moves distally. Loss of sufficient laminar attachments can result in a complete distal displacement of the third phalanx (“sinker”). Laminitis, is a severe clinical sign from many different diseases, including infectious diarrhea, pleuropneumonia, retained placenta, or endometritis. Carbohydrate overload, used experimentally to create laminitis, is similar to what happens when horses overindulge on green pastures or accidentally engorge themselves with grain. Other causes of laminitis are endocrine related. Insulin resistance/metabolic syndrome, or pars pituitary intermedia dysfunction (PPID, aka, equine Cushing’s disease), can result in laminitis, although the underlying pathology is quite different from cases related to diet or disease. Laminitis also occurs from mechanical overload to the structures of the affected limb. If a horse bears weight primarily on one limb, (e.g., after fracture repair), the contralateral limb will be forced to carry the additional weight, causing the supporting structures of the limb—including the laminae—to give way. Yet another cause of laminitis is from toxicity, notably from ingestion of black walnut shavings. What is the best treatment for laminitis? Currently most treatment efforts are focused on treating the initiating cause, controlling inflammation and pain, trying to restore blood circulation, and making adjustments to the hoof to try to alter hoof mechanics. It’s not always possible to eliminate the underlying cause of laminitis. For example, the underlying cause of PPID, benign enlargement of the pituitary gland, cannot itself be effectively treated. Similarly, if a horse refuses to bear weight on one limb, it is virtually impossible to stop excessive weight bearing on the contralateral limb. Such cases can be very frustrating. In cases where there is a treatable underlying cause, the underlying cause must be treated. Treatments may include dietary modifications, antibiotics, fluid therapy, or a variety of anti-inflammatory medications. In acute laminitis, icing the feet is often advocated. Icing may slow down inflammatory processes and may also impede enzymatic processes associated with the deterioration of the laminar attachments. Icing should be prolonged; as long as 72 continuous hours has been advocated. Due to the unique circulatory architecture, prolonged immersion in cold water will not harm the horse’s foot. Dimethyl sulfoxide (DMSO), a potent industrial solvent with anti-inflammatory activity that has best been demonstrated in vitro, may also be advocated. Nonsteroidal anti-inflammatory drugs (NSAIDS) are commonly used to relieve pain and inflammation. Alas, NSAIDs may not be very effective in relieving pain in more severely affected horses. Other pain-relieving medications that have been tried include gabapentin and fentanyl patches. Unfortunately, no medications are consistently successful in relieving laminitis pain. It has long been thought that laminitis is due to a failure of the digital circulation. Although histopathology casts doubt on that theory, attempts to “improve” digital circulation are common. Acepromazine maleate has been advocated because of its demonstrated ability to cause dilation of small blood vessels, although recent work has cast doubt on its effectiveness. Aspirin has been used as an anticoagulant. Isosxuprine hydrocholoride has been shown to be virtually biologically unavailable to the horse, and would seem to have little use in laminitis treatment. Mechanical adjustments are directed at trying to adjust the hoof capsule in accordance with theoretical concerns, although those concerns may be contradictory. Trimming of the horse’s foot in response to changes seen during laminitis is thought to be a hallmark of successful treatment. A stall filled with deep sand or shavings may allow a horse with laminitis to stand more comfortably. Various pads and boots have also been advocated to try to give the horse’s sore feet a soft place to rest. 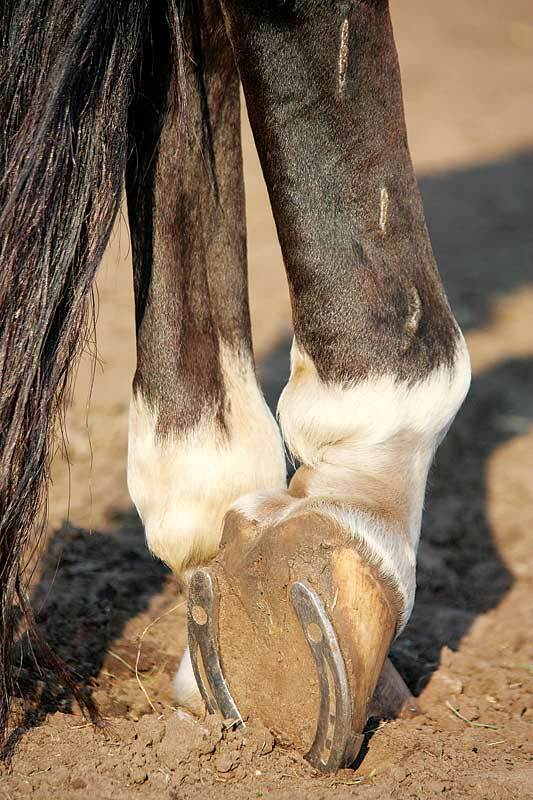 Raising the heels has been advocated in an attempt to reduce the pull of the deep flexor tendon; however, elevating the hoof also has been shown to increase tension in the laminae of the dorsal hoof wall. Wooden shoes have been advocated to help cushion the foot and allow break over in a direction of the horse’s own choosing. In severe cases, tenotomy of the deep flexor tendon may be suggested in an effort to reduce the pull of the deep flexor tendon. Laminitis prevention is far more successful than laminitis cure. Appropriate diet and/or pasture management is essential in at-risk horses. Horses should be kept at an appropriate weight so as not to incur the risk of laminitis associated with obesity. When disease is recognized, it should be treated immediately. Unfortunately, laminitis associated with endocrinopathies due to aging may be unavoidable. In spite of decades of research and centuries of concern, there is no single treatment that can be said to be effective in every case of laminitis. Nor can it be said that there is a “best” treatment; treatments such as the heart-bar shoe, said to be essential three decades ago, are hardly mentioned today. “Successful” treatment of laminitis appears to be related primarily to the degree of the initial insult and the ability of treatment to eliminate a primary underlying condition. Prior to treating a horse with laminitis, clients should be informed that treatment can be long, expensive, and frustrating. Dr. David W. Ramey is a Southern California equine practitioner who specializes in the care and treatment of pleasure horses. Visit his website at doctorramey.com. Columnists’ opinions do not necessarily reflect those of Veterinary Practice News.